The Forces AVENIR program recognizes, honours and promotes the commitment of young people in projects which enrich knowledge, arouse the desire for success and for surpassing oneself, encourage the development of community thinking and thus contribute to the development of socially conscious, active and responsible citizens who are both dedicated to their community and open to the world. This year, McGill has seven finalists (three individuals and four student-run initiatives) for Forces AVENIR awards, with winners to be announced on Nov. 10. Read about the four projects here. And to read about McGill's individual student finalists, see the Profile category. In today’s YouTube world, video is omnipresent. It seems like everyone and their cousin is packing some sort of recording device that they wield in relentless pursuit of that fabled 15 minutes of face time on the world stage. But amidst the self-serving dreck that clutters the Internet, there are few compelling stories being told and even fewer storytellers with a passion for anything other than themselves. And then there are the guys from Developing Pictures, finalists in the Art, Literature and Culture cartegory of the Forces AVENIR awards..
And they did, with Pritz and fellow Environment major Will Miller heading to Kenya right after graduating from Ithaca (NY) High School in 2009, armed with little more than a video camera and some crazy idea about pitching in and helping people in need. 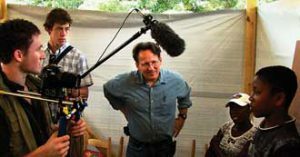 For the next five months, the pair traveled the country to film and produce mini-documentaries for small grassroots aid organizations like African Children’s Haven, an outfit that finances programs for orphans victimized by poverty, war and HIV/AIDS. On top of serving as free promotional material for cash-strapped organizations, the videos also encourage collaboration between academics and the people on the ground in Kenya. 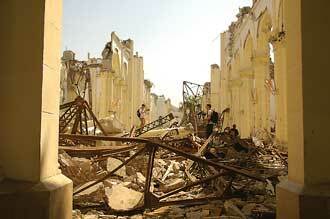 But if Kenya was Developing Pictures’ test flight, Haiti was where it really took off. “Kenya was a little more selfish for me,” said Pritz. “I got to travel around with my camera equipment, sleeping on people’s floors and bumming around in a really happy-go-lucky way. Despite the warnings of concerned friends and family, Developing Pictures sent two, three-man film crews to Port-au-Prince, Haiti, from Feb. 20-28 [reading week at McGill] to film the aftermath of the earthquake that had devastated the country a month earlier. “People had told us all sorts of horror stories and said we would just be soaking up valuable resources while we were there,” said Christian Elliot, another co-founder of Developing Pictures who is, you guessed it, also majoring in the Environment at McGill. “But we made sure to tread very lightly. We packed our own food [knapsacks full of protein bars] and purification pills so we were pretty self-sustaining.” [During their second trip to Haiti in August, the Developing Pictures team slept in an abandoned airplane]. Back home, the teams edited their mini-documentaries (“for every one minute of finished product we have to go through some 80 minutes of video,” said Pritz) and set out on the fundraising trail to raise both awareness of the dire situation in Haiti and funds to help the country rebuild. But the group also embarked upon a new path, launching Developing Pictures’s Reforestation Project. Since 1925, more than 90 per cent of Haiti’s forests have been cut down for commercial purposes (charcoal is the country’s chief fuel source). As a result, the country has lost a huge amount of valuable topsoil and is increasingly susceptible to flooding during the rainy season. Working with local partners and several agricultural schools, Developing Pictures is now spearheading efforts to help Haitian farmers begin the reforestation process using bamboo – a versatile crop that is extremely effective at mitigating soil loss and can be used in construction. Because it grows well on slopes, bamboo is extremely effective at reducing run-off and providing much-needed flood control. Bamboo products, such as furniture and textiles, can be a source of revenue for their Haitian producers as they have considerable export value. The group has raised money for five bamboo nurseries and, by Pritz’s calculations, has helped get some 13,000 square feet of bamboo planted in damaged areas. And, of course, the whole process has been well documented on digital video. “We don’t want Developing Pictures to be a closed circuit kind of thing,” added Pritz. “We see this as a social movement. And the beauty of it all is that you have no agenda, so you can do whatever you want and tackle whatever problems you want. All you need is the passion.” Not to mention a camera and a whole lot of protein bars. When a team of six McGill nursing students was carrying out a study on environment and health in the fall of 2009, they made a discovery that forced them to make a choice – ignore a potentially dangerous health risk that was probably outside their mandate, or do something about it. They chose to act. The team is one of the finalists for a Forces AVENIR Award in the health category. While making the rounds of a downtown Montreal social housing complex for low-income single mothers and interviewing its residents as part of their study, students Melanie Coté, Gabriel Domocos, Mary Bonsu, Windy Cloutier, Dominique Sinigagliesi and Karine Mekkelholt discovered the presence of mould, which is linked to a number of serious health problems, like asthma and other respiratory illnesses. Appalled at the conditions they found in apartments in a building on Guy St., the group decided to help. “It was our duty as nurses to make a tangible gesture and assist these women, who were living in conditions that were unhealthy for both themselves and their children,” said project member Mekkelholt. Mekkelholt and her colleagues set about creating tools, such as presentation, letter and report templates, that could be used to defend the residents’ rights with the relevant authorities. They also produced an official report describing the problem, which they addressed to the Société de l’habitation du Québec, the owner of the property. The tools, the team says, can be used in other contexts of social injustice. This May, they presented them at a conference of the Community Health Nurses of Canada. “I think there is a place for nurses in health promotion and prevention,” said Mekkelholt, who graduated from McGill last spring and is now pursuing a Master’s degree in nursing at l’Université de Montréal. “But I don’t think we take the opportunity to do so as much as we should. As for the mould problem, “things are moving in the right direction,” Mekkelholt said. McGill’s Society of Automotive Engineers (SAE) Chapter is every gearhead’s dream come true. 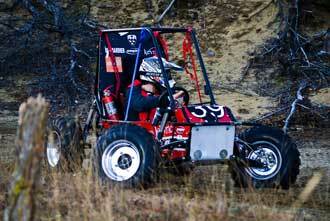 Comprised of McGill Baja Racing, McGill Racing Team, McGill Hybrid Racing Team and McGill Electric Snowmobile clubs, the SAE Chapter offers Engineering undergraduates the unique chance to design, build, test and race their own vehicles from scratch. But the SAE Chapter is more than just a glorified go-kart lab – it is a one-of-a-kind learning opportunity that pushes budding engineers to apply their burgeoning theoretical knowledge into practice. “The best part of our clubs is that you don’t need prior experience to join. Students gain that experience by diving in and getting their hands dirty,” said Sébastien Hylands, a fourth-year mechanical engineering student and one of McGill Baja Racing’s project co-captains. Once they’ve signed on, participants buckle up for a ride that sees them tackle various design challenges depending on their project. For example, all but the Baja club have to be preoccupied with energy consumption, or lack thereof, as their respective vehicles will compete against those from other North American schools at year’s end. In 2009, the McGill Racing Team’s prototype won top prize at the Michigan trials for the car with the lowest fuel consumption. Word of the quality of SAE Chapter’s vehicles is starting to get around, with Discovery Channel featuring the McGill Hybrid Racing Team’s prototype and the Electric Snowmobile’s vehicle having carried a torch-bearer at last year’s Vancouver Olympics Games. SAE Chapter is one of three finalists in the Forces AVENIR awards science and technology category. When asked why students would voluntarily join such a labour-intensive club during an already demanding school year, Hylands laughs. “Are you kidding? We love this,” he said. “None of us got into Engineering to do math – we’re in it because we all dream about building the fastest plane, the biggest bridge in the world. Like all good simulators, the annual McGill-run World Health Organization Simulation (MonWHO), allows participants to take a serious test ride without the fear of the crashing should they take a wrong turn. Established in 2007 by McGill medical students, MonWHO is designed to raise student awareness about global health issues, provide a means for students to play a proactive role in global health policy, acquaint them with the World Health Organization (WHO) and its role and develop inter-professional relations between future healthcare professionals as well as among students whose fields of expertise play a role in health policy. MonWHO is one of three finalists in the Forces AVENIR awards health category. This past March, medical students from across Canada got to experience what it would be like to be a WHO delegate during the onset of a crippling Level 6 pandemic. Each participant adopted the role of a member country’s ambassador and had to respond to live updates from their home governments, deal with the critical eye of the media and NGOs, and weigh the consequences of the private interests of powerful pharmaceutical companies while attempting to maintain united global leadership as the stress of the crisis quickly takes a toll on international relations. In short, they were in the hot seat. The overarching goal for delegates was to develop comprehensive guidelines toward how pandemics should be managed as a formal response to the panic erupting both in their home nation and internationally. At the end of the session participants adopted four final resolutions. Keynote speaker Gina Tambini of the Pan American Health Organization praised MonWHO organizers for the scope of the session. “Students are given the opportunity to grasp the importance of the stakes involved in public health on an international scale and take part in real debates on these issues. I think the event could indeed help foster a new generation of leaders in world health,” Tambini was reporter as saying on the Forces AVENIR website. Word of MonWHO’s success has spread and organizers have begun using their expertise to help a group of students in the UK to establish their own simulation event. Victoria Korsos, head of the event’s organizing committee hopes that the momentum gained by the annual meeting will keep going throughout the year. “We would like to enable students to benefit year-round from our initiative so as to raise even greater awareness of public health issues and encourage them to adopt a leadership role,” she said.